It wasn’t long after we found out we’d be moving to Japan that the idea of a trip to Australia came to mind. From the U.S., an Australian vacation is an expensive proposition, including a flight approaching 20 hours and several thousand dollars of travel expenses. However, from Tokyo, the northern coast of Australia is a little more than seven hours away. Over two weeks, we’ll have visited four Australian cities: Cairns in Queensland, Adelaide in South Australia, Melbourne in Victoria and Sydney in New South Wales. We’re already a week into our journey as I’m writing this on the flight from Cairns to Adelaide. Cairns (pronounced “Cans” by the locals) is on Australia’s northeast coast and is home to the Great Barrier Reef. At first glance, it’s a small tourist town, but as the week went on, the treasures of Cairns began to present themselves. 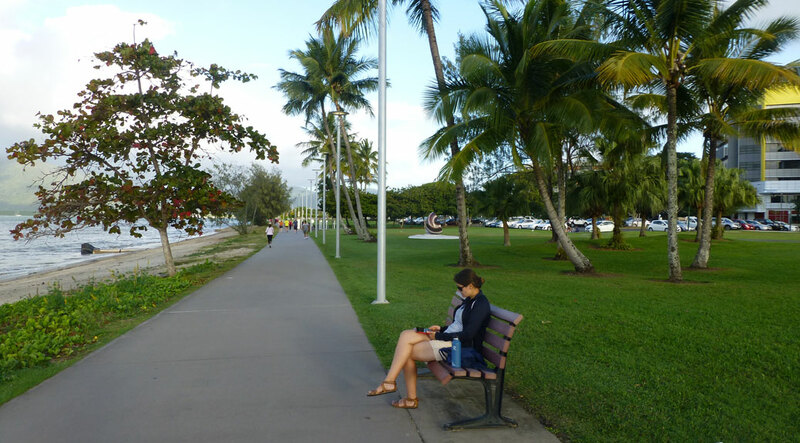 We stayed in the northern end of town, which is connected to downtown Cairns by the beautiful Cairns Esplanade. Running alongside the bayfront, it features wonderful greenspaces connected by a paved walking path that was usually most crowded in the late afternoon. 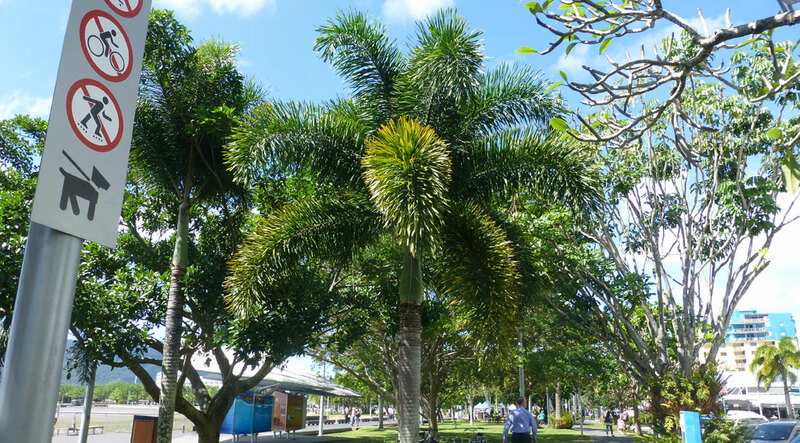 It was clearly designed to act as Cairns’ backyard. Free exercise equipment, beach volleyball courts, kids play areas and free BBQ/picnic spaces line the Esplanade, leading to the Lagoon, a free community swimming pool and lounging area. The downtown area is roughly five square blocks tucked between the Esplanade and the harbor. The obligatory souvenir shops, tour kiosks and a variety of beachwear stores border a wide selection of international eateries. The area comes alive on the weekends with a Saturday Market on the Esplanade featuring only locally-made goods. 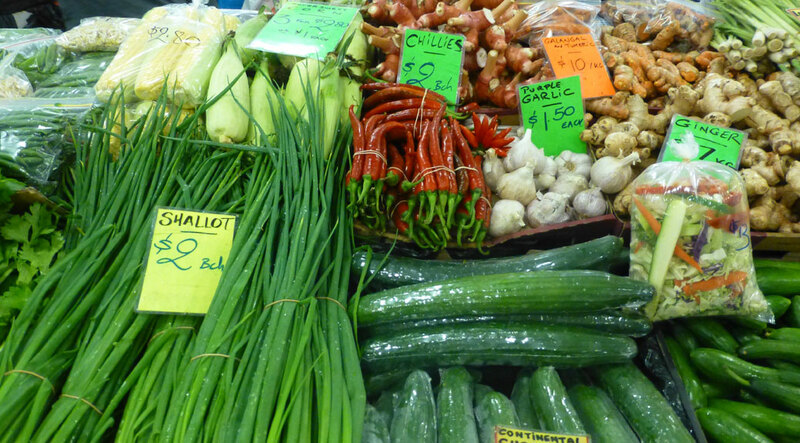 Rusty’s Market is a large, indoor farmer’s market that runs Friday through Sunday. Primarily a place for the local farmers to sell fruits and veggies, there’s also an abundance of local crafts and plenty of snacks. The Cairns Night Markets are open after 5 p.m. every night and offer another opportunity to snap up souvenirs. 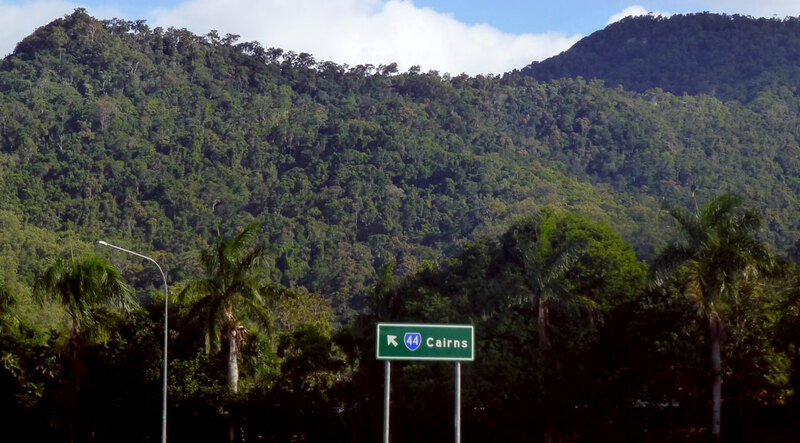 Cairns itself is sandwiched between two World Heritage Sites. To the east lies the Great Barrier Reef. On the west is the Atherton Tablelands, home to the Daintree Rainforest. According to one tour guide, the rainforest once covered the entire Australian continent, but now only covers one-half of one percent of the country. 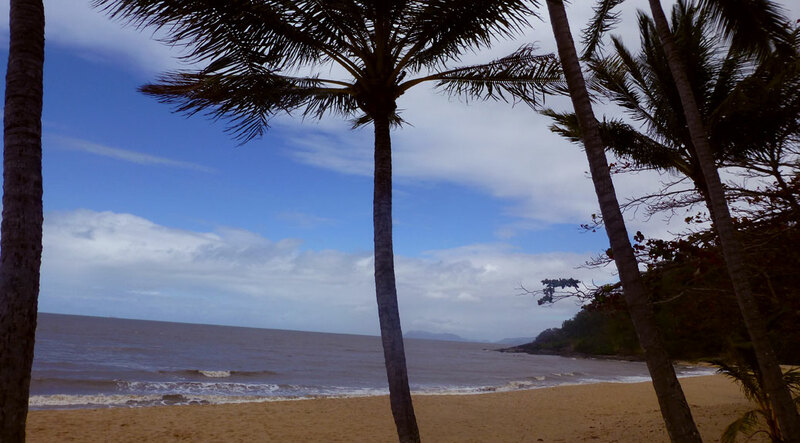 Further north are several beaches leading into the small town of Port Douglas. We spent part of a day walking along Trinity Beach. The unique beach sand was made up of larger flakes of rock and salt, which sparkled like diamonds against the tan backdrop. 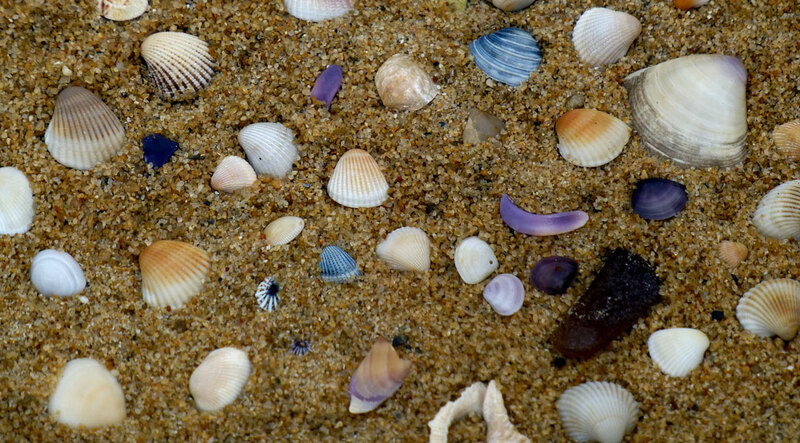 The tropical sea life that makes its home on the Great Barrier Reef left a treasure trove of classic shells on every beach. As with everything on the Reef, it’s okay to look, but we had to leave these beauties behind. Near one of the bus stops back to Cairns, several wallabies made a home in a large field. I’m sure we weren’t the first to confuse these guys with kangaroos, but a tour guide straightened us out later. 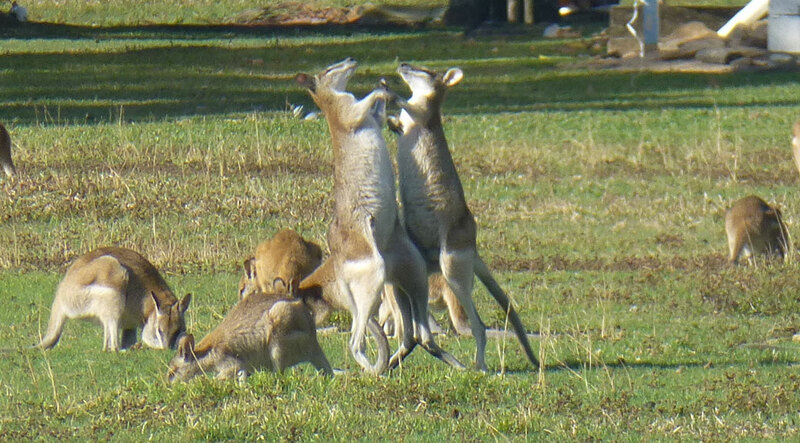 These guys were even putting on a classic ‘roo boxing match for us. Over the next couple weeks, I’ll go into more details of our trip to Cairns, including a couple very memorable trips out to the Great Barrier Reef and a local tour of the city as well as our adventures to come in Adelaide, Melbourne and Sydney. What a great opportunity to visit Australia. Can’t wait to hear more. Yeah, you made it. I know you’ll have a wonderful time. Oz is a beautiful country and the people are so friendly. For tours out of Sydney check these guys out. They specialize in small group tours that try to avoid the crowded tourist spots.